Yesterday morning at around 5am. A cyclist was involved in a RTC with a car on the A236 Mitcham Road. The man was pronounced dead at the scene by the air ambulance doctor. Rest In Peace! 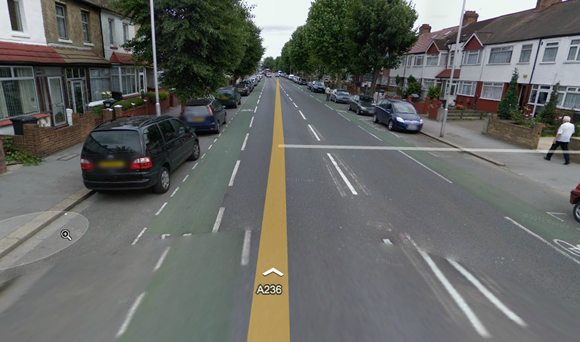 For those of you that don’t know Croydon and Mitcham Road, it has been the talking point of many cycling campaigners. Nearly a mile of cycle lane in the door zone in either direction. Parked cars on either side of this very busy arterial road and plenty of pinch points that do absolutely nothing! 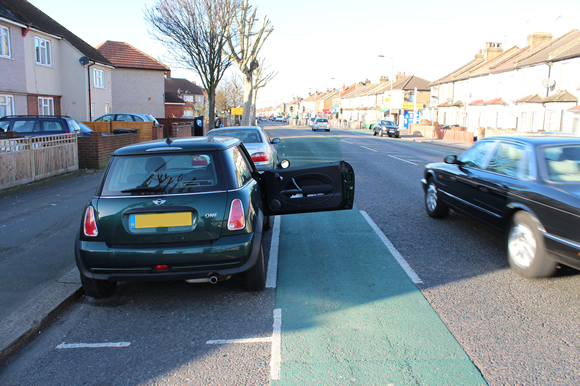 Most of the cycle lanes in Mitcham Road meet the recommended minimum standard width of 1.5 metres, however there is insufficient carriageway space available to increase the clearance from parked vehicles. This is why the lanes have been made highly visible with green surfacing used for the majority of the length, which should help to remind motorists that they should take care of cyclists using the route. 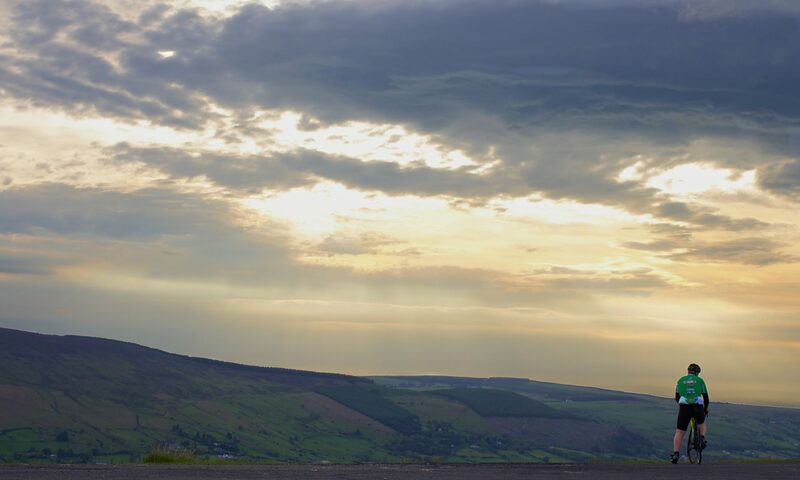 Some physical changes can be made as the resources become available; changing awareness and habits in respect of cyclists and motorcyclists is a longer term issue. I visited again this road on Monday morning with my traffic engineer and we have established two courses of actions. Firstly as these lanes were initially implemented as part of the London Cycle Network Budget and Project, about five years ago, it is long overdue for a review. On measuring the width of the cycle lanes we found that some of the lanes could be widened. 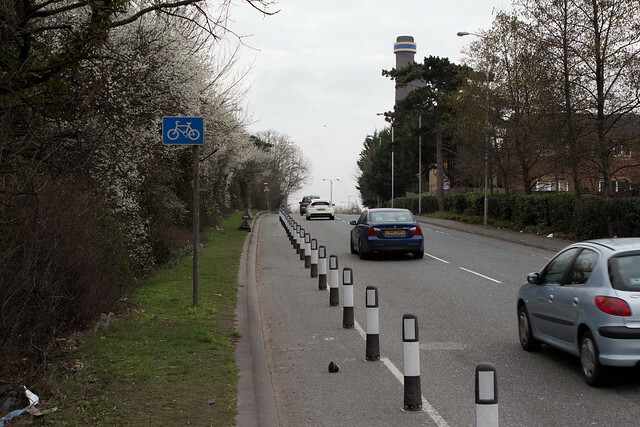 We aim to implement a review with a view to extend the cycle lane widths to give greater space for cyclists. Secondly there is a view to create a parallel route for the Mitcham road on quiet residential roads via Ockley rd and Rochford way and Westcombe avenue, from just beyond the Lombard roundabout for cyclists who would feel less confident in using the Mitcham road. The green paint mentioned in the first response has all but faded and is only the width of a car door! So this cycle lane is extremely dangerous to use, especially during the early hours of the morning when people are going to work and taking their kids to school. The insufficient width they talk about is down to parking that is allowed on the road. The A236 is the only arterial road I can think of in Croydon that allows residential parking like this. 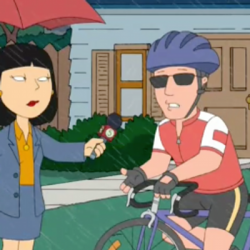 I was spurred on to contact the council about this stretch of road after my own RTC in which I broke my clavicle. At the same time I also queried what was being done with the £450,500 that was given to Croydon by the Mayor after being named a Cycling Borough. Unfortunately those funds where already being spent elsewhere (a cycling hub at East Croydon station) and could not be used to drastically improve one of the worst cycle lanes in Croydon.